QB Blake Bortles threw a touchdown pass to HB Leonard Fournette, but the Jets would get an interesting 75-yard Bilal Powell rushing touchdown on a play in which the defense thought he was down. In the second quarter, the teams would trade field goals and would go into halftime tied. The Jets would double their first half score in the third quarter, with a HB Elijah McGuire touchdown run and a field goal. A LB Myles Jack fumble return for a touchdown and a field to sent the game to overtime. The game nearly ended in a tie, until the Jets finally secured the 23-20 victory with a Chandler Catanzaro field goal. With that, we give you our PFF exclusive takeaways from the contest for each team. McCown had a few key mistakes that stopped him from having a solid day moving the offense. On the day he was charged with 3 fumbles overall, one on a backwards lateral pass thrown before his intended receiver was ready that was scooped up by Myles Jack for a touchdown. McCown threw an interception that was not his fault, as Bilal Powell slipped out of his break upon release. McCown’s work against the blitz was impressive, going 9-10 for 100 yards and a 108.43 passer rating. When pressure got to him however, his rating fell down to 56.3. The rookie out of Louisiana-Lafayette brought a spark to the running and passing game going for 131 total yards on 12 touches and he broke three tackles total. McGuire broke an impressive 69-yard run up the middle for a touchdown and averaged 9.3 yards per carry on his 10 rushing attempts. Wilkerson has been toiling of late, and his effort was particularly questionable against the Jaguars. He appeared unwilling to battle double teams, regularly finding himself blown off the ball. As a pass-rusher he managed just the solitary hurry, taking his season total to 7 hurries, 0 hits and 0 sacks on the year. 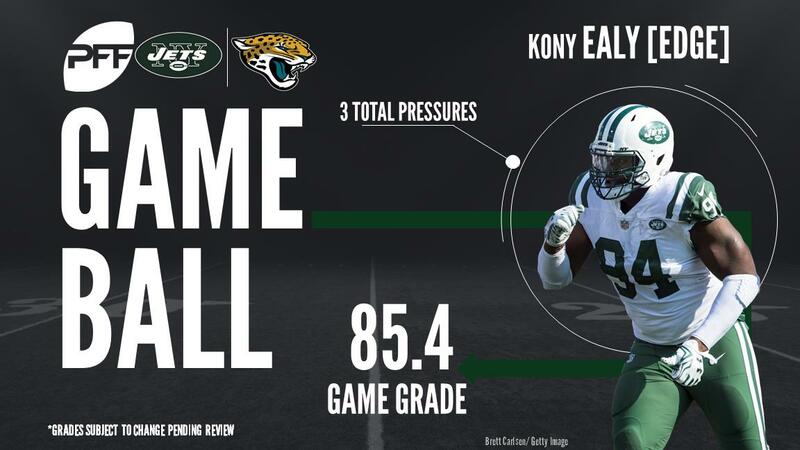 Ealy has a handful of dominant games on his resume, and he added another against the Jets. He was particularly effective at getting into passing lanes, batting down three passes, including deflecting one to himself for a momentum-changing interception. Ealy also added three hurries to an already impressive performance. Omameh has been a bit of a journeyman to this point in his NFL career, yet he seems to fit well in Jacksonville. Although Omameh remains highly inconsistent, he’s made great strides since entering the league. His greatest improvement has come in pass protection, where he’s allowed only two hurries through four games this season. Omameh gave up the solitary pressure against the Jets, and led the way among the offensive line in run-blocking grade. Jack was all over the field with a quarterback hit and ten tackles, six of them being solo stops. Jack’s scoop and score touchdown on a lateral pass was a turning point in getting the Jaguars momentum. Jack allowed all four of his targeted passes to be completed, mostly when he was zone coverage. However he closed quickly on pass catchers allowing, just 27 yards on those plays. Smith was on both extremes on Sunday against the run and pass but ended with a productive day. While he gave up all five of his targeted passes for 74 yards, he was highly productive against the run, posting a 93.4 run-defense grade. Smith ended with 13 tackles, including an impressive 7 solo stops.